Gentlemen, (or ladies, as if like me you end up buying your other half's wardrobe!) it's time to get your wardrobes ready for summer. The weather has turned and those old cargo shorts and crew neck T-shirts just won't do! Take a look at my list of must-have pieces for summer and get yourselves shopping! For a smarter tapered look go for this pair from Reiss - great with brogues and a sweater for a smart/casual look. Update your tops with some new slim fit polo shirts - much more interesting than an average crew neck T-shirt. Colour blocked, textured or a bold stripe like this one from Zara. 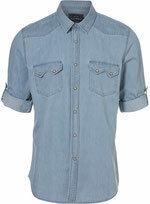 They may well bring back memories of the 80's but a denim shirt like this one from Topman is a Spring Summer 2012 must-have! Wear buttoned up and tucked in or open and layered over a T-shirt. Leave your heavy pocket cargo shorts behind and opt for a slimmer chino version - go for a bright pair if you dare, like this pair from H&M! A fine knit cardigan like this one by ACNE will be your new best friend. Wear it casually over a T-shirt with jeans or smarter over a shirt with chinos. A client recently bought this blue wool suit on his personal shopping session and it was such a great find. M&S are doing a range of Savile Row inspired beautiful pure wool suits that have a slim, modern sihouette. A great suit for work but also special occasions - love it! I bought the blue M&S suit on my shopping trip and it's the best thing in my wardrobe. I've used it for the office and a friend's wedding and love its tailored look and versatility.